This week's banana recipe for Banana Boats is a new concept to me, but apparently is familiar with other people! 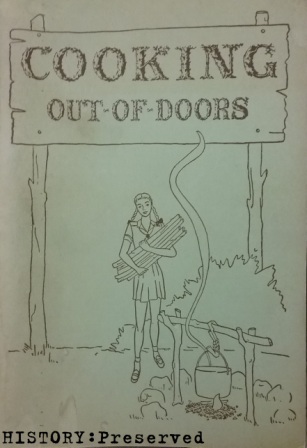 I found it in my Girl Scout camp cook book from 1946 called "Cooking Out-Of-Doors". It entails cutting open a banana, filling it with chocolate, raisins, and marshmallows, closing it back up, and then putting it in hot ashes to melt and get all gooey inside. Sounds like a much better version of S'mores to me! What a fun camping recipe, don't you think? I'm seriously going to try this one. One of the people that regularly makes these when they camp suggested putting nuts in it instead of raisins which I am totally on board for! Sadly, Vintage Banana Tuesday is winding down! We have two weeks left, and then when September comes I'd like to start something else. 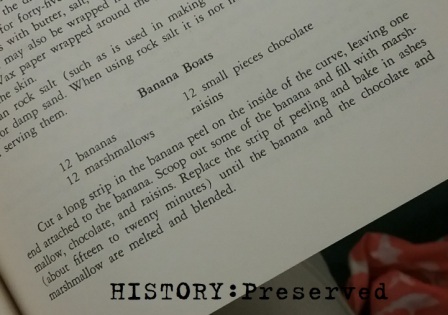 I have really loved exploring vintage banana recipes this summer, and I hope you've enjoyed them too! I still have oodles of fun banana recipes left to share, so I might start this series back up again next summer! This sounds really good! It's been fun seeing the wild banana combinations out there!